I love a beauty box and especially if the beauty box is filled with an array of luxury products! A new beauty box has launched recently called MINTD. The MINTD beauty box is all about luxury and what makes their box different is that there are only full-sized or deluxe sized products included in the box, the products are from luxury retailers (Harrods, Selfridges, Net A Porter, Liberty London, etc) and the box value is over £150. So for those of you who love a bit of luxury beauty (like me) then this is definitely a beauty box worth looking at. This month’s November box is a Winter Skincare Hydration themed box and is all about luxe products that soothe and comfort during the colder months. The change in season can often dry out the skin so there are loads of very rich, moisturising products in this box which I love. The November box features four full-size products and one deluxe size product and the value of the box is worth £153. The cost of a MINTD box is £65 per a month and a box is delivered bi monthly (every 2 months). Now I know you want to see what’s inside so here we go! Okay now first up we have the African Botanics Marula Plantes D’AFrique Shower Cream which is a very smooth, creamy body wash (Full Size at £41) that is perfect for the winter months due to its gentle formulation. I was quite excited to receive this product because I have not tried this brand before but have definitely heard of it. The product was inspired by an ancient African ritualistic bathing experience utilising wild-harvested botanicals and plants. The shower cream is chock-full of antioxidants and contains crushed Baobab Fruit and ancient volcanic lava minerals so it also polishes the skin which is good in the winter when your skin feels a bit lizard-like! Next up we have one of my favourite brands, Aromatherapy Associates who do a fabulous Moisturising Lip Balm (full-size worth £16) . My lips tend to get super dry during the winter and I am constantly applying all sorts of balms. This one smells absolutely amazing with ginger, vanilla and cocoa butter – yum! This is a great product to have on hand and I am a true believer that one can simply not have enough lip balms. Now I love a sheet mask and I simply can’t get enough of them. I really love the concept behind these Patchology masques (full size trio worth £21) which are flash masques. Great for someone like me who is constantly busy! So these work in five minutes (uh-mazing) but you can leave them on longer if you wish. I had not heard of this brand before (from the US) but I love their branding and products as I’ve now scoured their site. And they are stocked at Ulta here in the U.S. so must be good! I also liked that this pack was a trio of masques – an Exfoliate Facial Sheet, a Hydrate Facial Sheet and a Illuminate Facial Sheet – so you can choose the skin condition you want to target. The next product in the MINTD box is the Evidens- Rich Cream – this is the only product in the box that is a deluxe size but even this is worth £47 (full-size at £235). This brand is stocked at Harrods and it is a very luxurious brand that I have not yet tried so was pleased to get an introduction to it in this month’s box. This cream very much reminds me of Creme de La Mer because it has that same rich texture and is super moisturising. Really fabulous cream for the winter and my tip to make it last longer is to dab it around your eyes and lips. 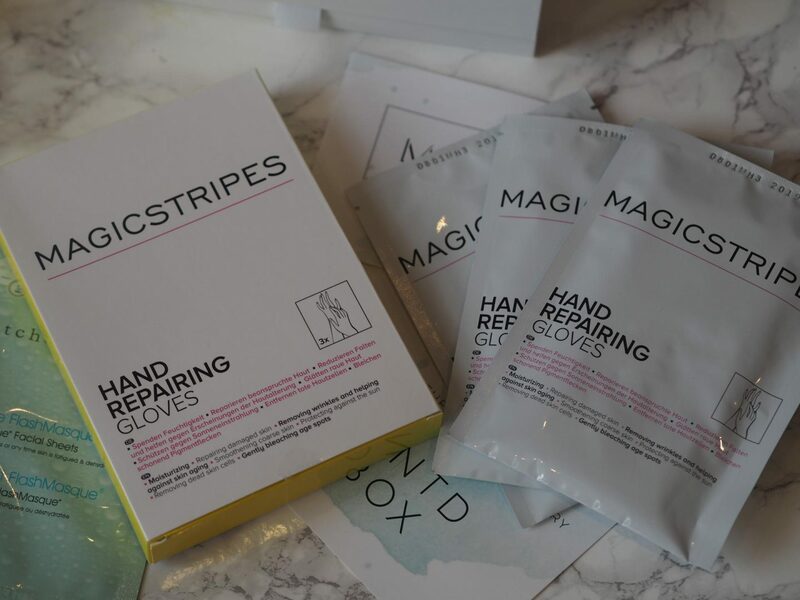 Now I was super excited to see these cool Magicstripes Magic Hands – Hand Repairing Gloves (full size worth £28) . Seriously these are amazing and my hands scream for moisture during the winter. As soon as I wash my hands I have to instantly apply hand cream – otherwise they feel horribly dry. So I was really pleased to see these gloves which does for the hands what a sheet mask does for the face. The gloves contain natural extracts, active molecules, shea butter and olive oil. You simply need to put your hands in the gloves and leave them on for 30 minutes. Perfect for a movie night in! If you are looking to try luxury, niche brands that can be hard to find and discover then I would highly recommend the MINTD box. The price of the box vs. the value is hard to beat as well and the products are really lovely, well-thought out and ones that I have sought previously and/or had not tried. The MINTD box makes luxury more accessible and if you love luxe beauty like me, then it’s a great little gift to receive for yourself! You can get 10% off the first box when you sign up with this promo code: 10OFF1STHH. Simply sign up at www.mintdbox.com. The Winter Hydration box is now available online and ships to UK , W.Europe, North America & Australia. Don’t forget to follow me on Instagram/Twitter for all my latest adventures!